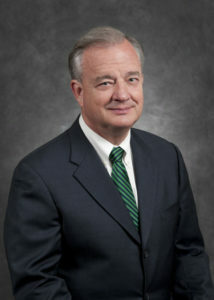 John Sharp was appointed Chancellor of The Texas A&M University System by the Board of Regents on Sept. 6, 2011. On September 7, 2017, Governor Greg Abbott named him the commissioner of the Governor’s Commission to Rebuild Texas, which is dedicated to rebuilding critical public infrastructure along the Gulf Coast in the aftermath of Hurricane Harvey. As Chancellor, Sharp leads one of the nation’s largest systems with an annual budget of $4.7 billion. Enrollment at the A&M System’s 11 universities has grown to more than 153,000 and externally funded research expenditures are in excess of $996 million. The System’s flagship, Texas A&M University, stands among the nation’s top 20 research universities for total research expenditures, according to the National Science Foundation. Sharp brings with him more than three decades of public service. He earned a bachelor’s degree in political science from Texas A&M University in 1972, where he was a member of the Corps Staff of the Corps of Cadets, a member of the 1972 rugby team and was elected student body president. Upon graduation, Sharp was commissioned as a second lieutenant in the United States Army Reserve. In 1976, Sharp received a master’s degree in public administration from Southwest Texas State University while working full-time with the Legislative Budget Board in Austin. In 1978, he opened a one-man real estate firm in Victoria and became a successful small business owner. That same year he was elected to the Texas House of Representatives. In 1982, he won a seat in the Texas Senate. Four years later, he was elected to the Texas Railroad Commission. Sharp was elected state comptroller in 1990 and re-elected in 1994. He came to the A&M System from Ryan & Company, where he was a principal with the largest state and local tax consulting firm of its kind in Texas. Sharp has been married to Charlotte Han of Austin since 1978. They have a son, Spencer; a daughter-in-law, Brigitte; a granddaughter, Simone; and a daughter, Victoria. The Sharps are active members of St. Mary’s Catholic Church in College Station and are involved in many community and humanitarian efforts. Download High Resolution Photo of Chancellor John Sharp.